The DEPTH module adds a lot of space and makes the sound feel wider and bigger. At 0%, the signal is clean. At 100%, the signal has a wide stereo image with modulating effects and some small amounts of delay. Clipping LED. 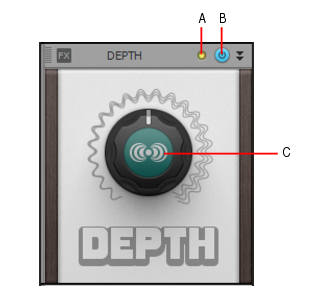 Shows if the input signal to the DEPTH module is clipping. If there is any distortion in the ProChannel signal chain, the clipping LEDs let you identify where the clipping occurs. DEPTH enable/disable . Enables/disables the DEPTH module. DEPTH. Adjusts width of the stereo image and amount of modulation. At 0%, the signal is clean. At 100%, the signal has a wide stereo image with modulating effects and some small amounts of delay.